Tiger Mountain includes one of the most popular hang gliding spots in the area. Just east of Issaquah on the Issaquah-Hobart Road is the landing zone for gliders who launch off of Tiger Mountain. Tiger Mountain is also home to Tiger Mountain State Park a very popular and well-used hiking and picnic area. The trail head entrance can be recognized by the area with parked cars visible on the north side of Interstate 90. 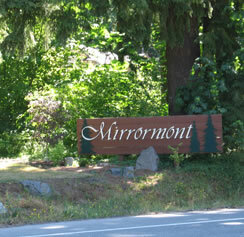 Tiger Mountain also includes the Mirrormont development which, like many of the residential areas in the Four Creeks area is in heavily wooded neighborhoods with homes on larger lots that vary considerable in size, design, and layout.